Jon founded Puget Systems in December 2000. Today, his primary role is to make sure everyone else has the tools and resources to do their job, providing a great product and customer experiences. He is also the face of the company with our partners and vendors. Jon started Puget Systems because he felt there was a need he could fill. In his opinion, the industry was full of low-quality product and sales tactics that didn't care about what customers actually needed. He wanted to provide a quality product with a purpose. 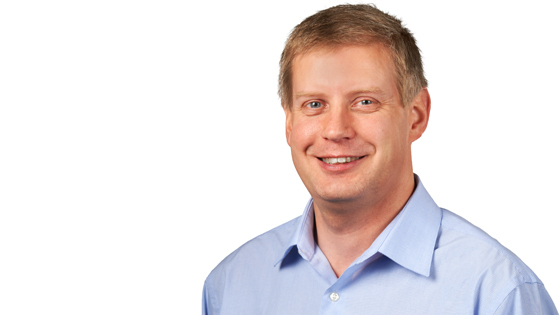 In addition to his role at Puget Systems, Jon also represents the company on the Intel Board of Advisors, which helps Intel see the real-world application of their products, and how to better serve their users. Outside the office, Jon is an avid trumpet player, and enjoys the opportunity to volunteer for church orchestras and local musical productions. He enjoys spending time outside with his family, camping or Jeeping up in the mountains all around the beautiful Pacific Northwest. Fun fact -- the first platter drive was by IBM in 1956. It was 5MB, cost $50,000 and was the size of two refrigerators. If this drive had that same price and density, it would cost $10B, and would be the size of the USA, and tall enough to knock all of our satellites out of orbit. Honestly I think we only continue to carry this drive because it is so amusing to think about. But we still occasionally find someone who needs them! If you need to read floppy disks, don't even think about a floppy drive inside your computer anymore. Go USB like this unit. Modern motherboards don't even come with a controller for internal floppy drives anymore! This power supply is extremely efficient, and will completely turn off its fan under low load (such as when your PC is idle). It is a great pick for a silent PC. We have negotiated pricing with Cyberlink for this software, so it is cheaper to buy here than just about anywhere else. If you plan to play Blu-Ray movies, you should buy this, and let us install and test it for you, so it is ready to go out of the box. We ship Windows 10 Pro with "Defer Updates" checked. This delays the installation of feature updates (but you still get security updates right away). We've found this to be a very good thing. Microsoft seems to be putting significantly less time into testing their updates now -- if you are the first to install an update, YOU are testing it. We recommend NOT being a part of that first group. Defer updates, and when you get the update, it will be well tested, and whatever software you run will have had time to issue updates to fix any problems caused by the new Windows features. We have seen SO MANY computers be broken by buggy Windows 10 updates, so we have decided to ship our Windows 10 Pro computers with this option enabled by default. I strongly recommend Windows 10 Pro instead of Home. The Home edition does not allow you to defer feature updates. We've found this to be a very bad thing. Microsoft seems to be putting significantly less time into testing their updates now -- if you are the first to install an update, YOU are testing it. We recommend NOT being a part of that first group. Defer updates, and when you get the update, it will be well tested, and whatever software you run will have had time to issue updates to fix any problems caused by the new Windows features. We have seen SO MANY computers be broken by buggy Windows 10 updates, so we have decided to ship our Windows 10 Pro computers with this option enabled. So...get Windows 10 Pro instead, and take advantage of this feature. Let someone else be the guinea pig. I loved Windows 7, but it is starting to show its age. Technically it is still supported, but I believe that it is quickly becoming an afterthought for Microsoft. In addition, we've experienced overwhelmingly lack-luster enthusiasm from hardware manufacturers about spending much time on writing drivers for Windows 7. The lack of dedication from both Microsoft and hardware manufacturers has created a recipe for a bad time. While *technically* supported, the experience of running Windows 7 is not so good these days, at least on modern hardware. Everything is intended for Windows 10 now. I was just as big a fan of Windows 7 as anyone, but the time has come to move to Windows 10. I don't recommend the 6800K processor. It only has 28 PCI-E lanes, instead of the 40 PCI-E lanes found on the rest of the CPUs in this line. That creates some odd effects on many motherboards, where slot lane allocations are modified, creating more constraints and problems. If you're going to go with the high end X99 chipset, do yourself a favor and don't cripple it by using the bottom-of-the-barrel CPU in that product line. This is an excellent, well secured, quiet CPU cooler. We can mount the fan on either side, we automatically orient the cooler to exhaust the air in whatever direction makes the most sense. I really appreciate that versatility.